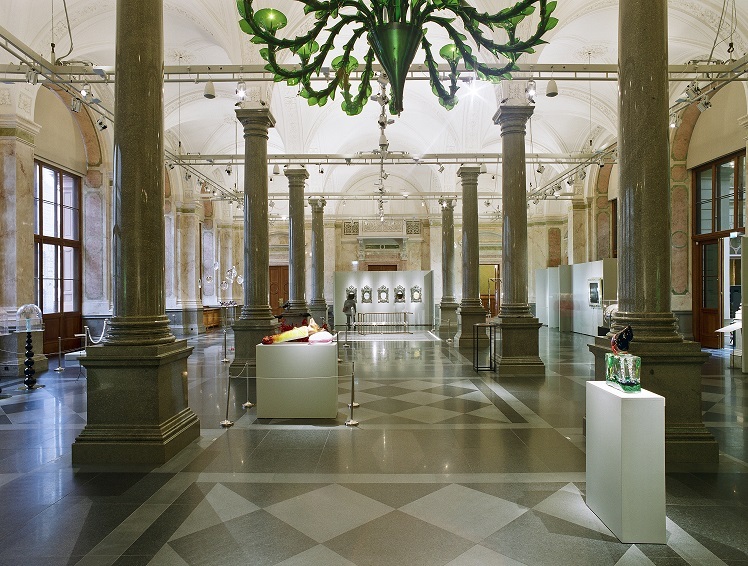 After several years of reconstruction, the Riga Stock Exchange became the Latvian National Museum of Art “Riga Bourse” and opened its doors to the public with the stunning inaugural exhibition Glasstress Riga – Works from Berengo Studio in the summer of 2011. This was no coincidence as the architectural form of the 19th century building echoes that of a Venetian palazzo. The exhibition symbolized new cultural possibilities in Riga, creating a connection between Venice and Riga, and overcame boundaries, whether they were material, time, cultural or geographical. In addition to proving once more the unlimited artistic possibilities of glass, Glasstress Riga highlighted the special world of Venice through its most iconic elements re-imagined in a contemporary way including ornate mirrors by ORLAN and Fred Wilson, chandeliers by Javier Pérez and Yuichi Higashionna and even the ubiquitous Venetian pigeons made their presence known through Jan Fabre’s installation. Latvian artists Sarmīte Mālina and Kristaps Kalms turned their attention to a different phenomenon in Venice – its cathedrals and their domes. One of the most striking pieces, however, was the gondola realized by Russian artist Dmitri Gutov, fragmented and suspended in the atrium of the Riga Bourse.